I’m almost as excited about Jack Johnson’s new album as I am about the splash screen he’s using to promote it. Now, 98% of the time, splash screens are a notoriously bad idea – both for usability and conversion. However, Jack Johnson’s website these days is a splendid example of when to use a splash screen and how to do it. Jack Johnson’s temporary splash page for his new album, To The Sea. 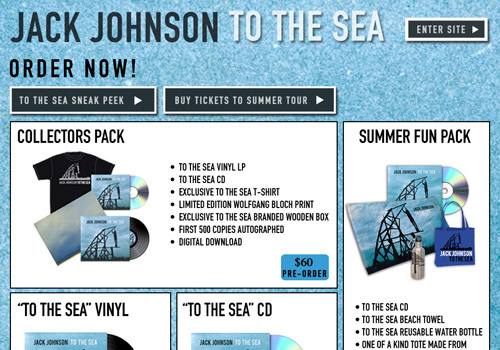 Jack Johnson’s new album, To The Sea, is being released June 1st, less than a week from now. So the entire homepage has been dedicated to things only relevant to this release: where you can pre-order the album, how you get the special editions, where you can get tickets to live performances, etc. When your business is offering a single product that almost all your customers will care about and the offer is time-sensitive in one way or the other (e.g. a product launch, when you open up for sales, or if one of your products were mentioned on Oprah) – then it is in fact a good idea to clear out the entire homepage and do a custom splash screen just about this one product. Your splash screen should have information about the product and links to where your customers can buy it (if applicable). It’s a good idea to have more than just a single piece of information about the product on your splash screen – show a few different options or features. Jack’s splash screen is once again a good source of inspiration – here the visitor is presented with a few different ways to experience the new album. When it comes to the design of the splash screen you have pretty free hands to do whatever you like. Away with all the standard navigation. Use a new layout if you like. Everything is game, except for your brand’s style. While you’ll want people to pay extra attention and notice the difference, it’s still a good idea to use a few of your brand’s recurring themes and styles so people don’t think they’ve entered the wrong website! Finally, you should of course always provide a prominent link to the “normal” website so your visitors have a way to find your regular content too. Do you have other examples of when using a splash screen is actually a good idea? Or perhaps you’d just like to show us a few examples of really poor splash screens? Authored by Jamie Appleseed. Published on May 26, 2010. Anything new to report on splash screens/ single product launches?